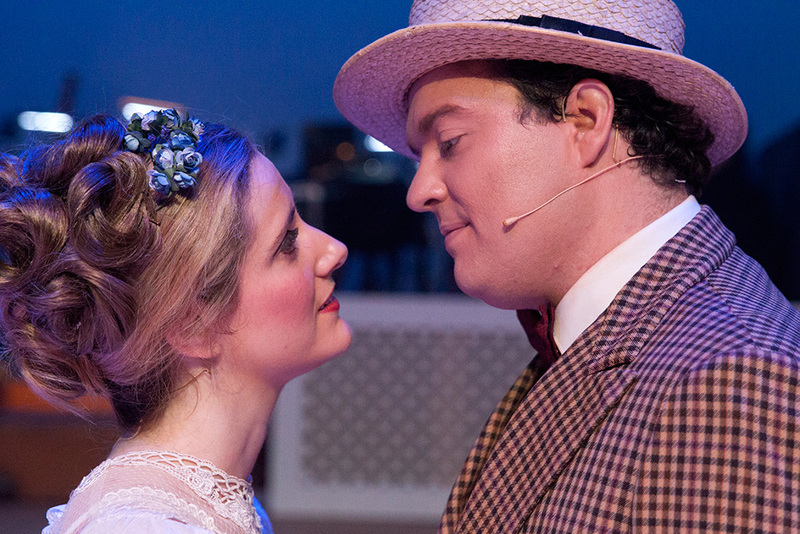 OSMaD transports audiences back to Broadway’s Golden Age in this meticulously crafted, beautifully performed production of Meredith Willson’s The Music Man. 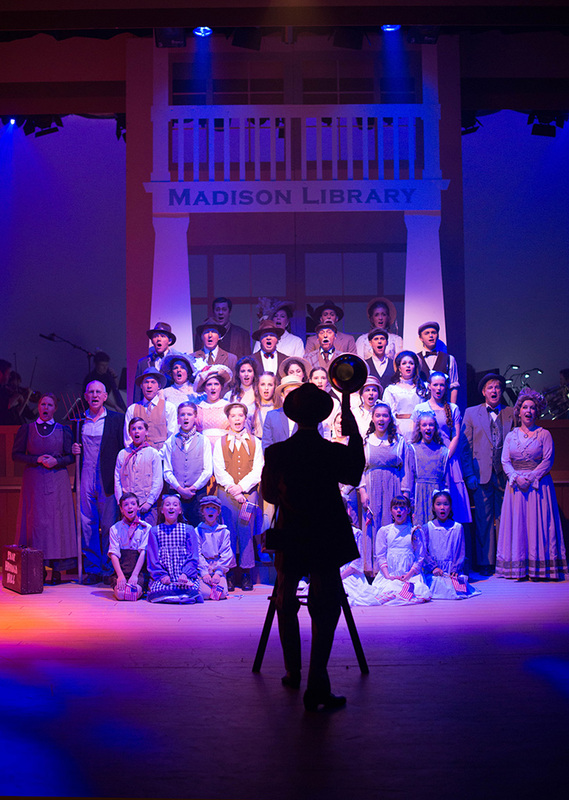 Entertainment on a lavish scale, the staging boasts a massive cast of 42 performers, including 12 incredibly talented children, and a massive orchestra of 24 players, all having a wonderful time bringing the world of stubborn Iowans and travelling conmen to life. One of the rare musicals for which one writer was responsible for music, libretto and book, Willson’s masterful score is as much about the sources of music as the storyline is. Melodies and rhythms ingeniously spring from natural situations – “Rock Island” pairs salesmen’s patter with the clickety clack of a train trip; Marian and her mother carry out their evening chatter to the tune of Amaryllis’ “Piano Lesson”; Amaryllis’ crosshand piano piece provides the tune for Marian’s wistful prayer “Goodnight My Someone”; gossiping biddies of the town cluck their way through “Pick a Little”; and the natural syncopation of town name “Gary, Indiana” becomes a catchy children’s song. The curved stage and auditorium of the Geoffrey McComas Theatre creates an intimate connection between audience and cast together to share an immersive visit to parochial hamlet River City, Iowa. 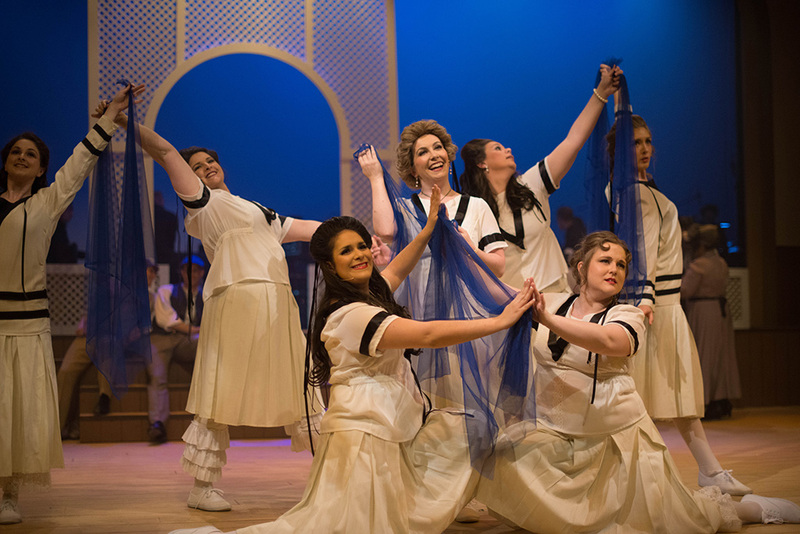 Even with band in full view upstage, the stage space is expansive, providing ample room for the wonderful full company song and dance numbers dotted throughout the show. Director Richard Perdriau has clearly taken great care to bring out all the heart and soul of this classic show. The fluid staging zips along, with the focus of the audience’s attention and affection clear at all times. Having prim librarian Marian Paroo’s defenses melt so rapidly creates significant tension in act two as her burgeoning, as yet one-sided romance with brash salesman Harold Hill threatens to unravel before it has barely begun. Highly accomplished musical director Ben Hudson leads rows and rows of the finest virtuosos in the generously sized orchestra. Brass playing is particularly thrilling, with multiple strings also creating a lovely sound. The many dance breaks, pleasingly uncut, provide ongoing moments for the orchestra to truly shine. With support from Assistant MD Greg Smith, Hudson has also brought out the best in the singers. The School Board turned barbershop quartet sounds superb, lyrics in rapid patter songs are crystal clear and ensemble harmonies are strong. 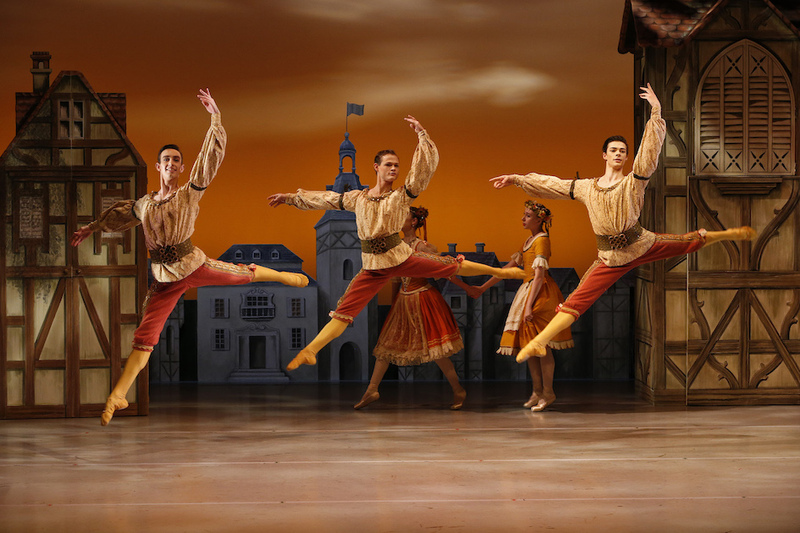 Perdriau’s work in creating the century-old setting is supported brilliantly by choreographer Louisa May Mitchell. Having drilled the cast to perfection, Mitchell’s flair for placement, precision and variety, not to mention her delightful sense of humour, can clearly be seen. Dance breaks, particularly those featuring the ‘teens,’ are gorgeously styled, drawing on a ballet vocabulary rarely seen any more. Perhaps it is the luxury of only producing one musical per year that allows OSMaD to invest so much time and care into the quality on stage. 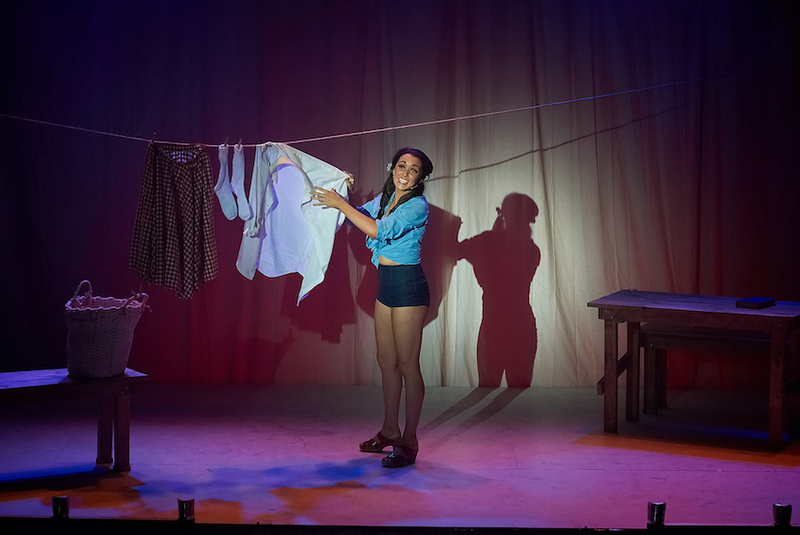 The staging is characterized by a distinctly unified vision, in which sets, costumes and lighting complement each other perfectly, and performers are working with a shared style and focus. Stage, legs, bandstand and extra set pieces are all painted to resemble rich woodgrain, the (countless) costumes are largely hued in pale earth tones, and the lights create a nostalgic sepia tone effect. Perdriau’s set design keeps the space open to view the band while still utilizing many changes of scenic elements. Purpose-built sets that transform the front of the bandstand are particularly clever. Ros Turnley’s costume designs are mind-boggling in their breadth, with performers having several changes throughout the show. Marian’s blossoming nature is cleverly shown through her progressive change of colours and hairstyle. The School Board’s growing unity is shown in their change to matching outfits. Harold’s white shoes in act one are a dapper touch. While the earthy palette creates a consistent look, the opportunity is missed to feature splashes of colour to assist the audience in keeping track of colourful characters such as Marcellus, Ethel Toffelmier and Tommy Djilas. Danny Issko and Ben Kocsis’ lighting bathes the cast in warm, natural light, keeping faces clearly seen even in the absence of floods of white light. Glenn Bardwell’s sound brings out the wonderful playing of the orchestra and expertly balances the large number of voices on stage. James Cutler is quite extraordinary as Harold Hill, having talent to spare for the challenging role. A naturally charismatic actor, it is Cutler’s rich baritone voice and terrific dance skills that really set him apart in the role. A generous and skillful scene partner, Cutler creates an authentic connection with each actor he appears with, elevating the work of others with his talents. Blessed with a soprano voice of the most exquisite, angelic quality, Laura Slavin gives a highly memorable performance of Marian. Having shown the full power of her voice in her thrilling performance as Christine in CLOC’s The Phantom of the Opera, Slavin adopts a gentler tone for Marian’s divine solos and duets. Slavin and Cutler enjoy strong chemistry and their central performances are the icing on a delicious cake. Wendy Alberni projects twinkling warmth as Mrs Paroo, her lilting Irish brogue a pleasure to hear. Katie Packer elicits plenty of laughs as self-important mayor’s wife Eulalie Mackecknie-Shinn. Geordie Worland, Tom Goodwin, Chris Handley and Damien Calvert do a sterling job with the barbershop quartet harmonizing. Talented actor Darren Mort makes the most of Mayor Shinn, but slows his speech to make Shinn’s dialogue easy to hear, losing a little of the humorous pace and bluster of the role in the process. Timothy Oon provides energetic support as Harold’s partner-in-crime Marcellus Washburn. Ben Jason-Easton is utterly adorable as Marian’s dear little brother Winthrop. 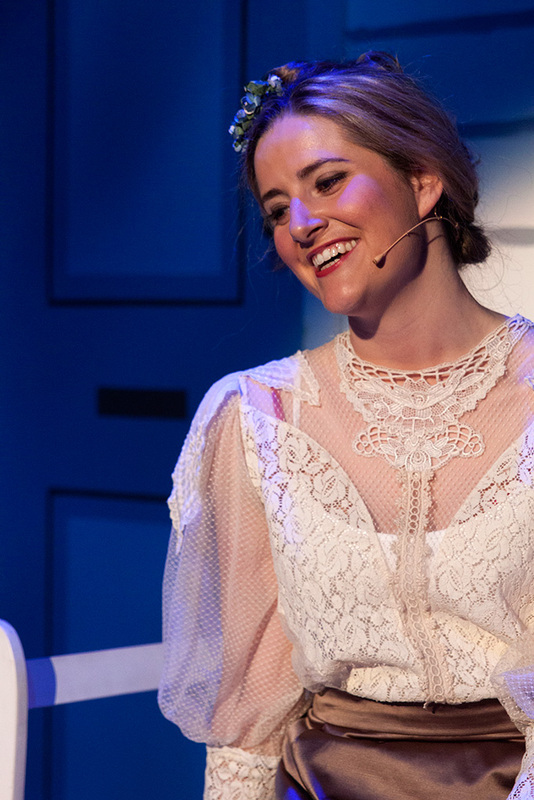 Allegra Annetta has an accomplished, polished stage presence as Amaryllis. 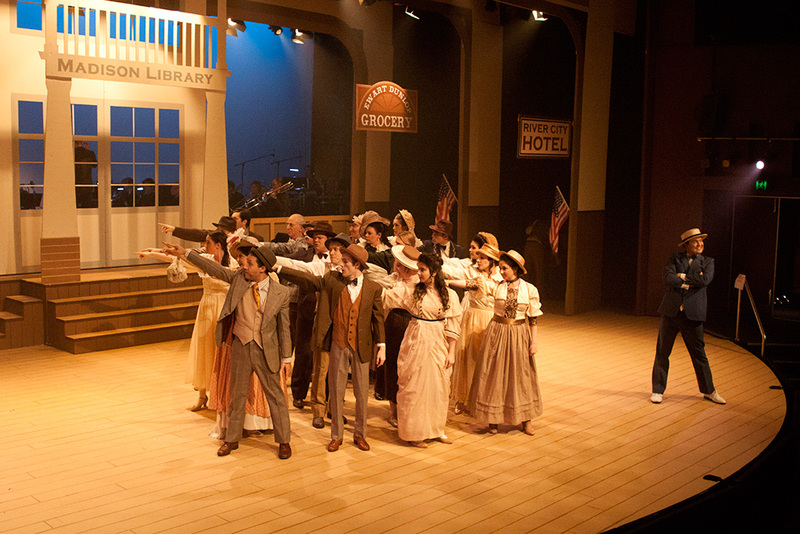 Fans of this era of music theatre heaven should not miss OSMaD’s The Music Man. 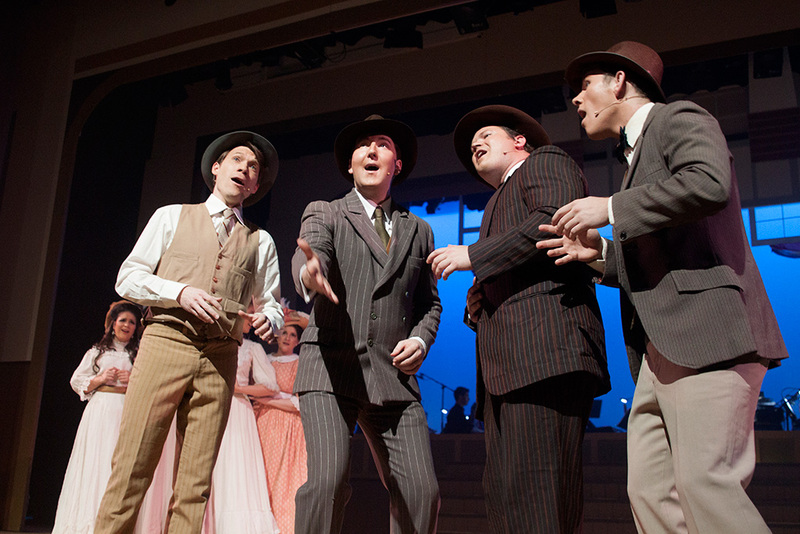 The Music Man plays at Geoffrey McComas Theatre, Scotch College Hawthorn until 19 October 2013. This review published on Theatre People 12 October 2013. It’s actually Geordie Worland, not Geordie Woodland. Very sorry about that, all fixed now. I think I was too focused on getting your first name right (autocorrect was fighting me on it). Congratulations on the show and your wonderful singing. Looking forward to hearing it again next weekend! Very kind words indeed! The show is just getting better and better, so you should be in for a treat. 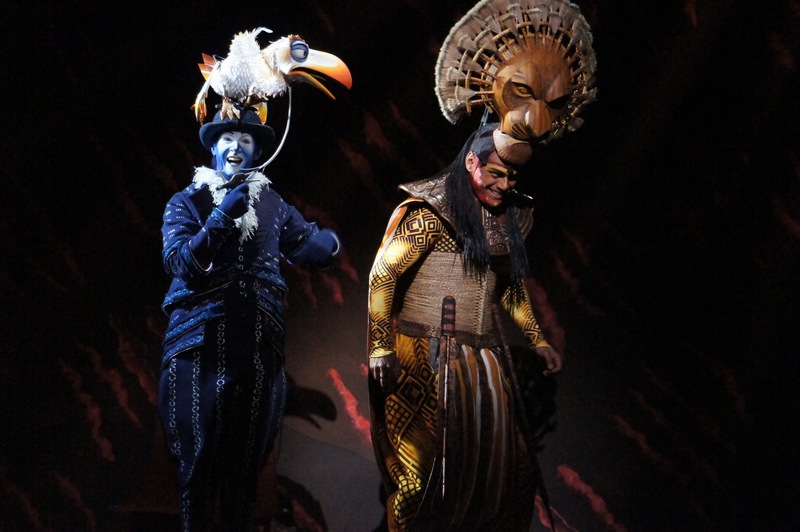 I loved this production Mark – enough to go back next weekend! I played Marcellus once, so The Music Man is a bit of a personal favourite. Looking forward to your off-broadway reviews!